It's felt like winter in NW Wisconsin since early October, but it is officially winter now. This cute Winter Duck, from Kinda Cute by Patricia Alvarez, is sending Warm Winter Hugs your way! I colored up Winter Duck with Copic markers, using a die found at Dies R Us -- it's a Yvonne Creations Christmas Die. Papers on this card are also from Kinda Cute by Patricia Alvarez. The blue snowflakes are from the Blue Christmas paper pack. The gold dots are from the Science Digital papers. 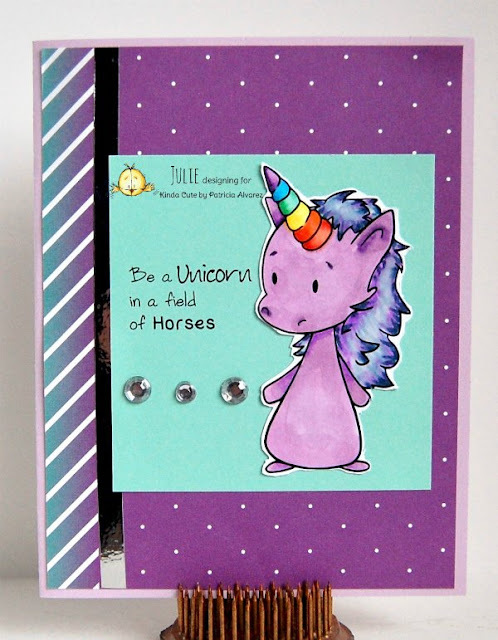 Check out the Kinda Cute by Patricia Alvarez blog to see great inspiration using her images. Then, there's the Kinda Cute by Patricia Alvarez Facebook Group for even more inspiration, games, challenges, and prizes. Merry Christmas, blog readers! Thanks for stopping by today. Christmas cards are behind us, and it's on to the new year. 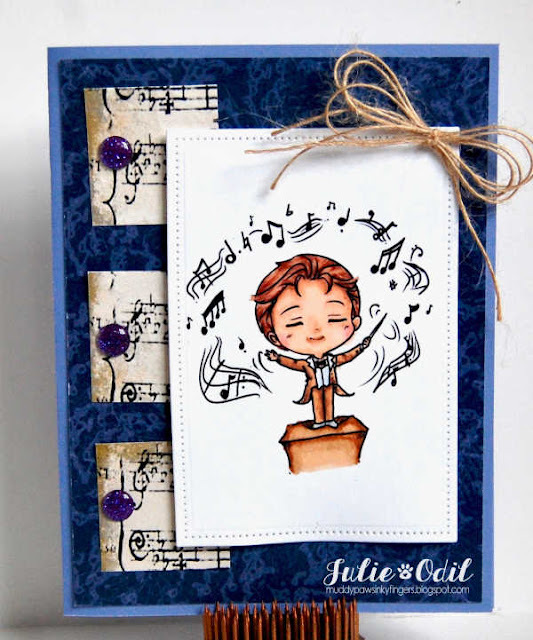 The always svelte Margaret is putting in an appearance today with this re-release of a favorite at Bugaboo Stamps. Don't you wish you looked that good? This is Margaret Calendar Months - January. I colored Margaret up with Copic markers, then fussy cut her out. The sentiment was computer generated. Sorry, I have a warped sense of humor! The papers on the card were found at Pixel Scrapper. It's a great site for finding that particular piece of paper you're looking for. The champagne flutes are a die found at the Dies R Us store. They are by Tutti Designs. 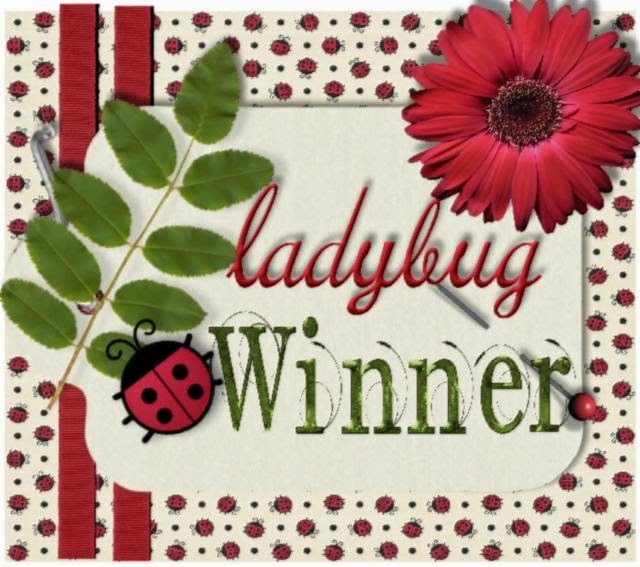 Visit the Catch the Bug blog to see what the other talented designers did with this delightful image, then buy it for yourself. It will be on sale this week! 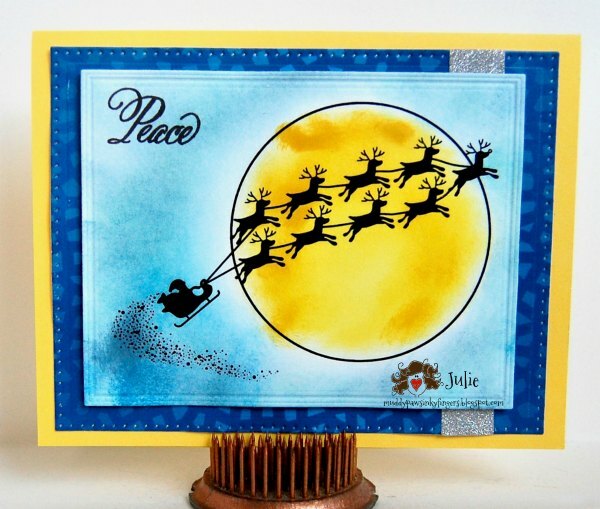 This is Santa Reindeer, printed on white card stock, then inked with various colors of Tim Holtz Distress Inks. This Santa Reindeer image was released during the recent Raise the Hoof event. If you haven't participated, you have until Jan. 4 to win some awesome prizes! Today, this month's New Releases are being showcased at All Dressed Up Stamps. There are several new releases, but I had the awesome, fun experience of being able to color up Sharing At Christmas. I colored up Sharing at Christmas with Copic markers. The sentiment was computer generated. 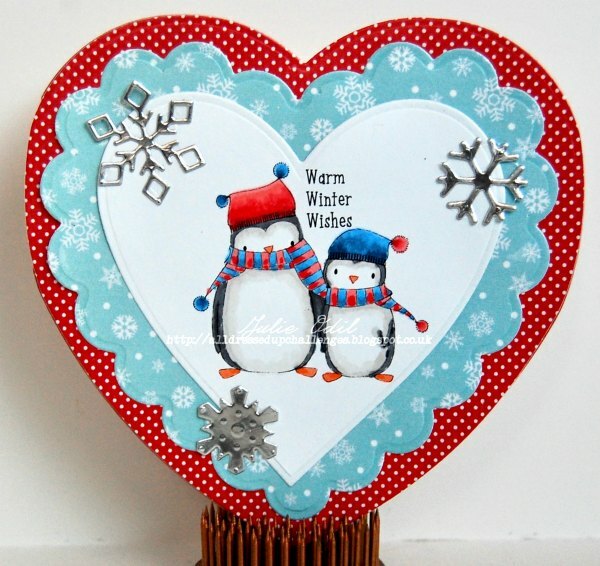 I used a variety of heart shaped dies to cut out the Sharing at Christmas image and to make the heart shaped card. Papers on this card are by Kinda Cute by Patricia Alvarez. 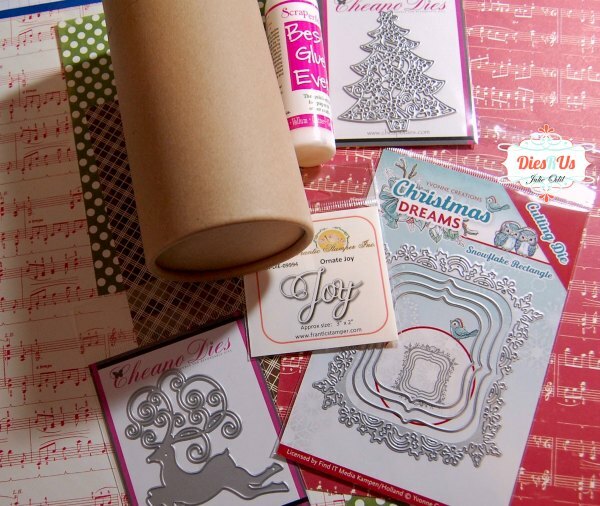 The silver snowflakes are a variety of cutting dies. I believe they are from Lawn Fawn and Crafter's Companion. You can see all of this month's new releases by visiting the All Dressed Up blog and the All Dressed Up Facebook Group. Snap up your favorites, then join in on the challenges! I'd love to see your creations! I'm writing a quick post, combining a couple challenges at the Outlawz -- one of my favorite places to play. 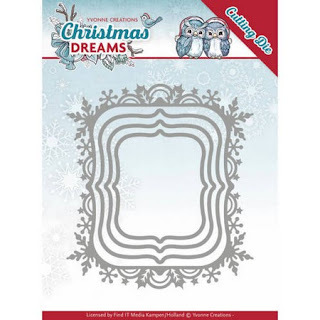 This image is the progressive freebie for December, from Star Stampz (thank you!). I colored him with Copic markers, then used a stitched die from Spellbinders to cut him out. I followed that exactly, didn't I? Papers on this card are from We Are 3 Digital Shop. They are part of the Holiday Wishes collection. 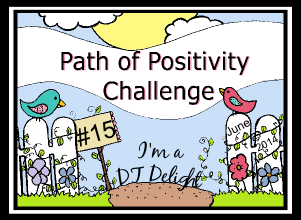 It's Monday, and more precisely, the 3rd Monday of the month, so that means it's time for some mid-month inspiration on the Path of Positivity Challenge Blog. We've been having color themes this year (optional, any positive themed project is all that's needed to link up). this month, the color is Silver, Gold, and other Metallics. I used an embossing folder and silver paper to create the background, then a pre-printed image from the Life is Better set for the focal point. The sentiment is part of an acrylic stamp set from stampendous. The paw print paper is from AMBillustrations, and is digital. The bone brad is another metallic element on my card. That's it for this metallic-themed project. I hope you have a chance to join us with a Gold, Silver, or Metallic project of your own. Link up at Path of Positivity Challenge Blog. I'm posting today for Sasayaki Glitter Challenge Blog, where it's time for some mid-challenge inspiration. The theme this month is "Happy Holidays". Of course, you can celebrate whatever holiday you want. It doesn't have to be Christmas! This adorable digi is called Snowman and Duck. I colored Snowman and Duck with Copic markers. They look quite cozy together in their matching Winter outfits, don't they? The papers on this card are from We Are 3 Digital Shop. The blue papers are from the Christmas Magic Collection. The pink snowflake paper is from the Loving Winter Collection. 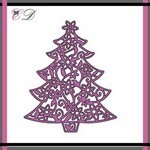 Do you like the snowflake die cut? That's from the Dies R Us Store. 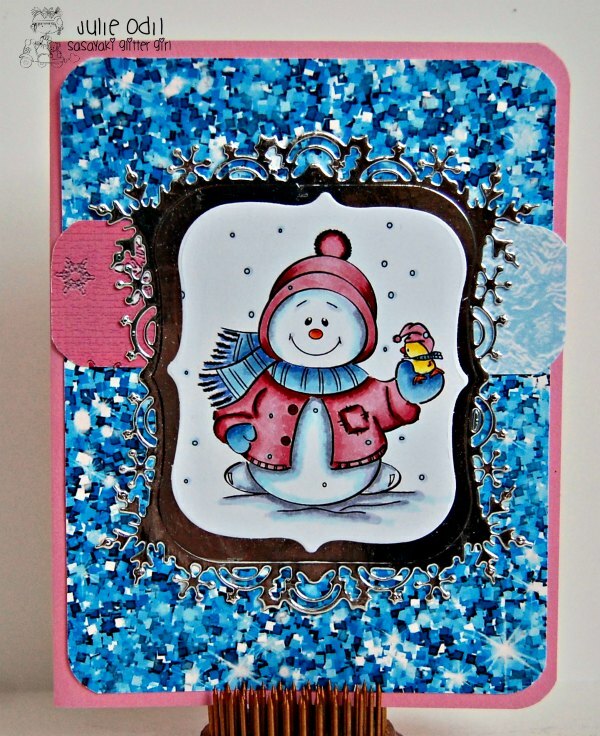 It's from Yvonne Creations -- it's the Snowflake Rectangle Die Set. I hope you can find time this busy, busy month to join us at Sasayaki Glitter Challenge Blog for our Happy Holidays Challenge. We've got such great digis for you to win! Holiday Greetings, deer friends (pun intended)! I'm posting today on the Dies R Us inspiration blog. Is Christmas really less than 10 days away? Yikes! I have a super simple holiday card to share with you today. You can whip it up in a flash, when you realize, you're short of cards. It can work for either masculine or feminine! Yea! I love this Cheapo Dies Scrolly Deer. It die cuts beautifully in every material I've tried it with. I think it's so elegant. Place it center stage on a card, and bam! your card is all but done. Papers on this card are from We Are 3 Digital Shop. The houndstooth paper is a new release this month. It's one of the new Holiday Houndstooth papers. The light colored background paper is part of the Holiday Wishes Collection. December 15 -- woah! This is getting close to Christmas! Dec 15 -- it's also time for some mid-challenge inspiration on the DigiStamps4Joy Challenge Blog. Challenges are always Anything Goes with an optional theme. This month it's Christmas/December. I was able to color up my all-time favorite snowman for today's challenge. I'm so excited! This is Mr Snowman, colored with Copic markers. 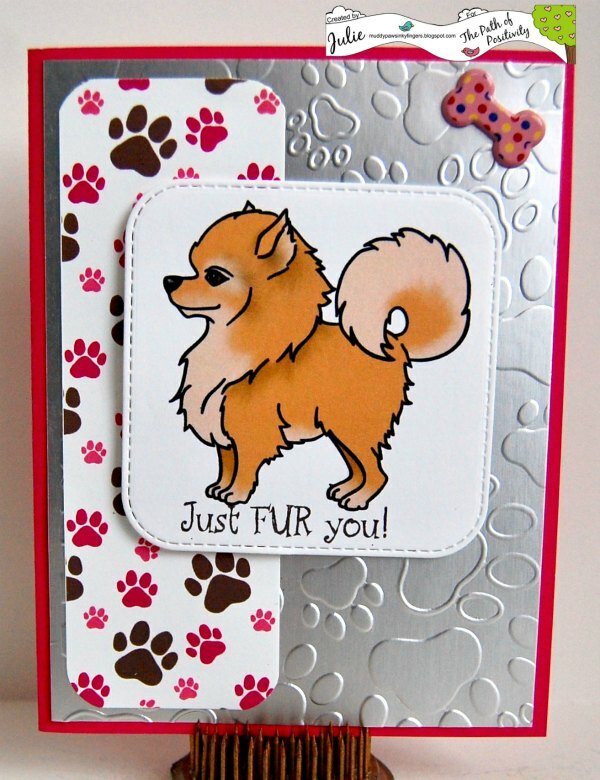 Papers on this card are from Kinda Cute by Patricia Alvarez. They are part of the Blue Christmas Digital Papers. The sentiment is an acrylic stamp from Technique Tuesday. 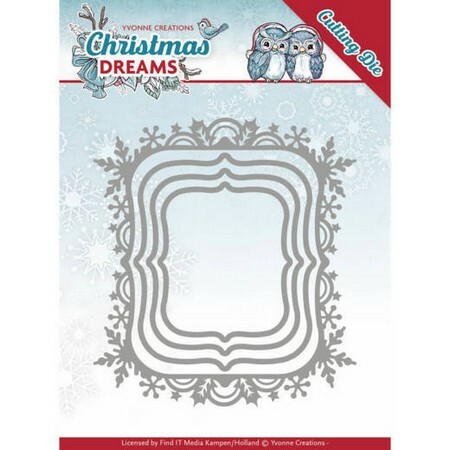 The big silver snowflake is a stitched cutting die from Lawn Fawn. 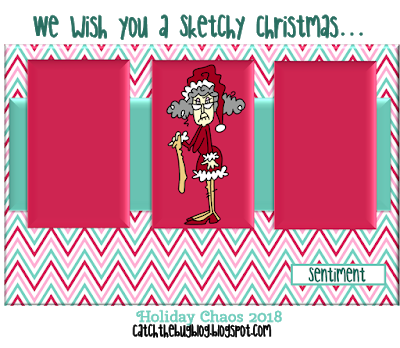 I hope you find time during this busy holiday season to join in the challenge at DigiStamps4Joy Challenge blog, where the optional theme is Christmas/December. It's Saturday, and there's just 10 days to go until Christmas! How close are you to ready? 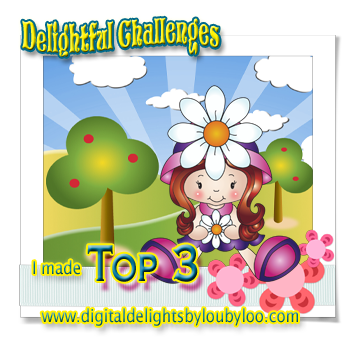 Today is the start of a challenge at the Di's Digi Designs Challenge Blog. The theme for this challenge is Winter Holiday. Christmas, New Year's, any winter holiday you wish! I colored 3 Chilly Polar Bears with Copic markers. Aren't they a cheerful bunch? I just love them! Papers on this card are from We Are 3 Digital Shop. 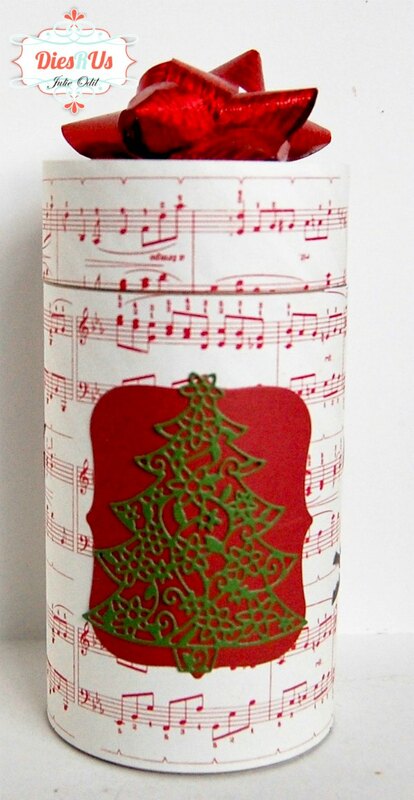 I used a paper from the Christmas Magic paper collection and from the Loving Winter paper collection. 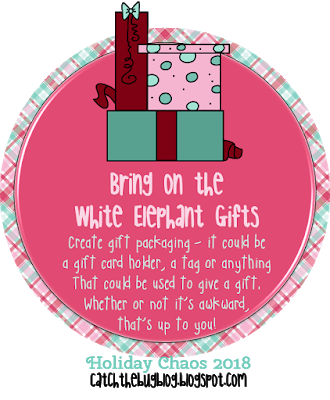 I hope you can join us the next 2 weeks for our Winter holiday challenge at Di's Digi Designs Challenge Blog. It's a busy time of year, but we've got such cute digis for you to win if you link up! This darling snowman tag is a printable tag. It's called Huggable Snowman Love Letters 3D Printable Tag. I cut out 2 of the printed tags, computer generated the to/from on them, fussy cut them, and found some papers that matched. Papers on this card are from We Are 3 Digital Shop. They are from the Peppermint Paper Collection (on sale!). 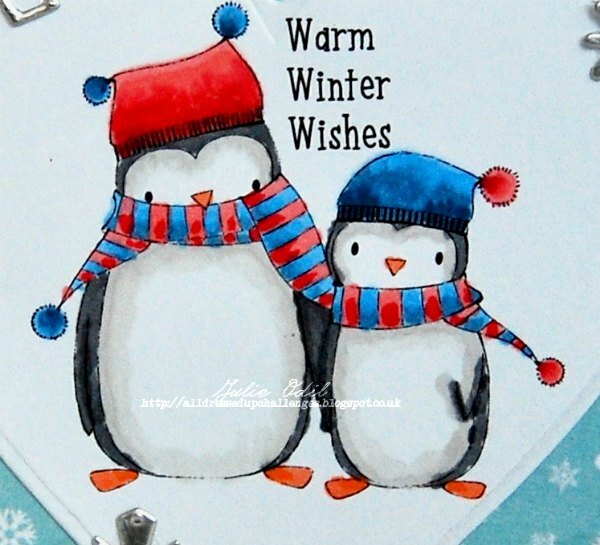 The tag behind the 2 printable snowmen is a cutting die from Close To My Heart. The twine is from Timeless Twine. I know this is a super busy time of year, but I hope you are still make a few Christmas cards, and you have time to link them up with our Santa's Helpers theme at Aloha Friday Challenges. There's still another week! 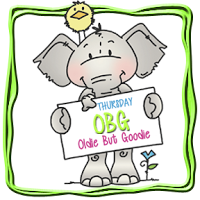 It's Thursday, and on the Catch the Bug Blog, that's Oldie but Goodie day. Hey, I qualify! I colored up one of my favorite winter/Christmas images for today's Oldie but Goodie entry at Bugaboo Stamps. I colored Winter Kidz with Puppy with Copic markers, mounted it on Kraft paper, then added some Christmas papers from my very messy work desk. These papers are from Kinda Cute by Patricia Alvarez. They are part of the Blue Christmas papers. 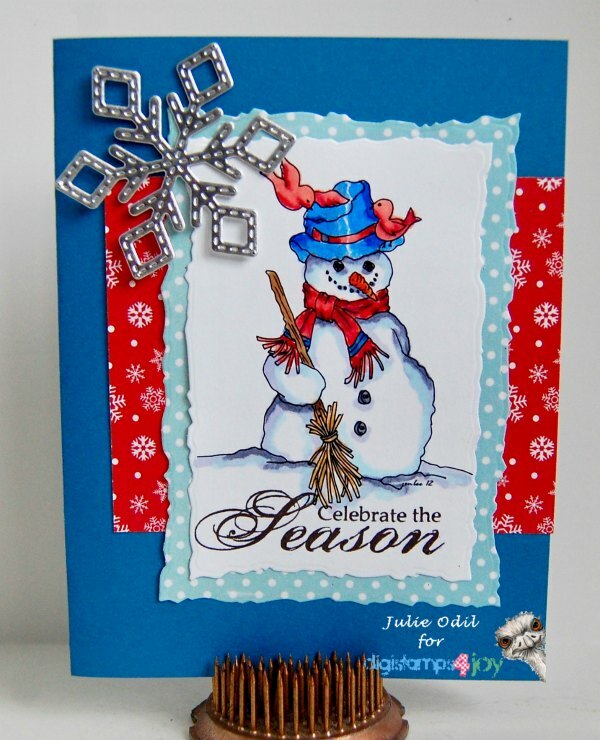 That glittery red snowflake was cut out with a die from Cheery Lynn designs. 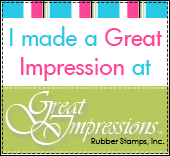 The sentiment is an acrylic stamp from Close To My Heart. There you have it, one of my favorite oldie but definitely a goodie! Winter Kidz with Puppy. Go grab it for yourself, then enter it in a challenge at Catch the Bug challenges, and you could win more Bugaboo Stamps images to play with! 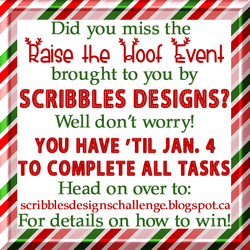 The The Scribbles Designs Challenge Blog is having a 12 day Raise The Hoof Christmas event. Each day, there is a task to complete to be eligible for prizes. They all have something to do with Santa's under appreciated helpers -- the reindeer! By the end of the 12 days, each reindeer, Santa, and the sleigh will all be featured, and you'll have a chance to win one, or maybe even all of them! That is one jolly Santa, isn't it? I colored Santa with Copic markers, using some icicle Stickles glitter glue on the white trim to add sparkle. The sentiment is computer generated. Papers on this card are from We Are 3 Digital Shop. The houndstooth is a new release this month. It's part of the Houndstooth Neutral Collection. 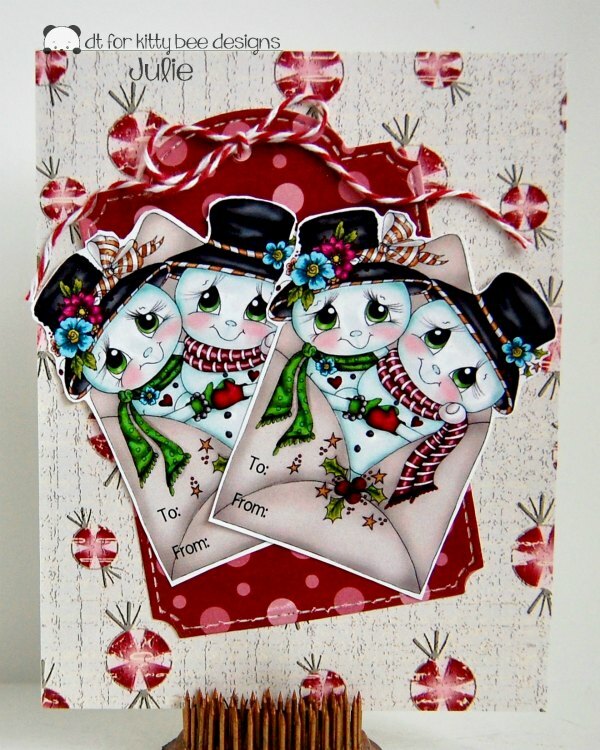 The red snowflake paper is from the Winter Sunshine paper collection. 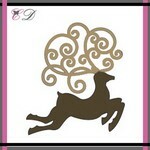 If you haven't checked out all 12 Days over at the Scribbles Designs blog, it's definitely worth your while to do so. You've got a great chance to win wonderful prizes! Get going! Season's Feetings, I mean greetings, everyone! Today is new release day at Bugaboo Stamps. Every Tuesday, it's time for a new release! Today's new release is Seasons Greetings Feet. This is actually a re-release, so if you don't have it yet, you can pick it up for 1/2 price! I colored Seasons Greeting Feet with Copic markers, then went to work finding the perfect background for all those Christmas feet! I cut out this card on my Silhouette Cameo 3. It is large enough to fit in a business size envelope. 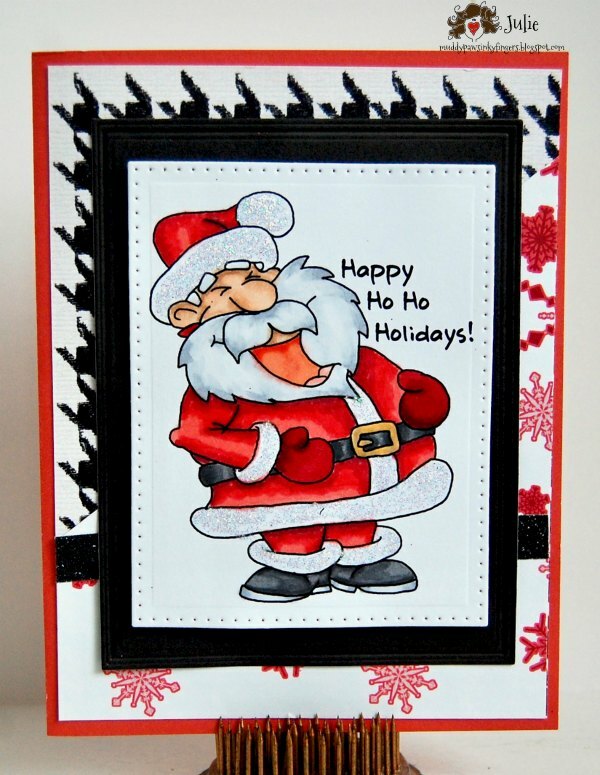 The Santa hat paper is from Kinda Cute by Patricia Alvarez. It is one of the Bright Christmas papers. I found that corrugated silver foil paper in my stash. I have no idea where I got it from or who makes it. The red snowflake is a cutting die by Cheery Lynn. Check out the Catch the Bug Blog to see what other Bugaboo designers did with this delightful Seasons Greetings Feet image. 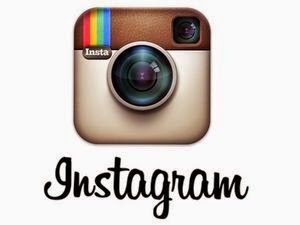 Check back each day to see the wonderful inspiration. There's always lots happening at Catch the Bug! It's Sunday, and it's New Release Sunday at DigiStamps4Joy. There are a number of wonderful new releases that you'll want to check out, both in the DigiStamps4Joy shop, and on the blog, to see what other designers made with them. I colored Christmas Unicorn with Copic markers, giving him a rainbow, magical (hopefully) look. I found those fun papers at AMB Illustrations. I thought they were perfect with the rainbows, unicorns, and stars. The sentiment was computer generated. The glitter stars are from Close To My Heart. Don't forget to visit the DigiStamps4Joy shop to see the new releases, then visit the blog to see the brilliant art from the other talented designers. Grab a new release, and enter this month's challenge! It's Anything goes, with an optional Christmas/Holiday theme. This is a Kraft container that I've had in my stash of alterable goodies forever, and I pulled it out to decorate for a special friend. I covered the container with a Christmas paper, keeping the pattern simple and small so it wouldn't overwhelm the die cuts. After that was done, it was just a matter of using some of the Best Glue Ever to attach the die cuts to the container. In case you're wondering what gift is going in the can, one of my best friend loves socks. I have a couple of very fun pairs of socks to fit inside. Perfect! 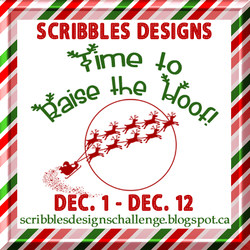 The Scribbles Designs Challenge Blog is having a 12 day Raise The Hoof Christmas event. Each day, there is a task to complete to be eligible for prizes. They all have something to do with Santa's under appreciated helpers -- the reindeer! Blitzen is premiering today. He's the handsome dude on the right. His partner, helping him today, is Donner. By the end of the 12 day event, you'll be introduced to, and have a chance to win, all 12 reindeer, Santa, and his sleigh. 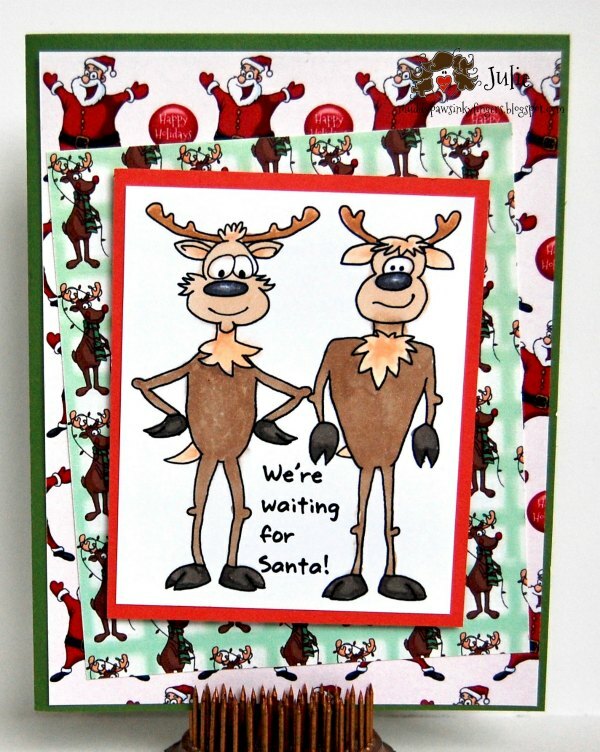 The 2 reindeer, Blitzen and Donner, were colored with Copic markers. 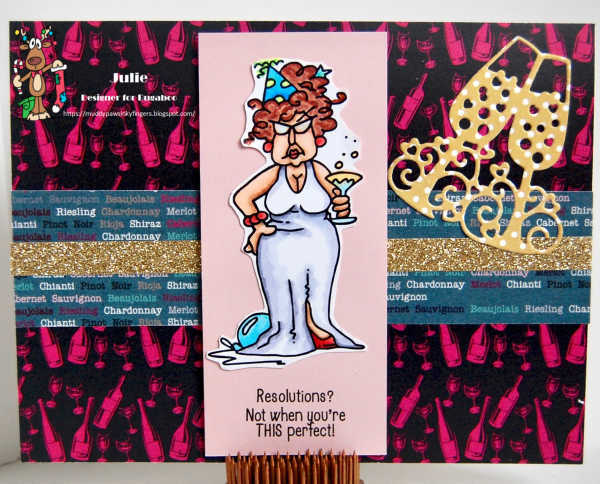 The fun designer papers on this card are by Decosse's Dynamite Doodles. 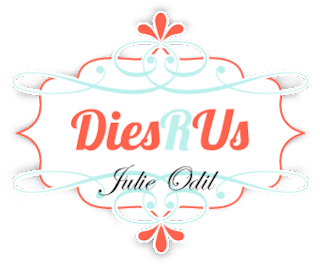 I hope you find time to join in the find at Scribbles Designs blog. There's lots of prizes to be won, and tons of great inspiration! Check it out! 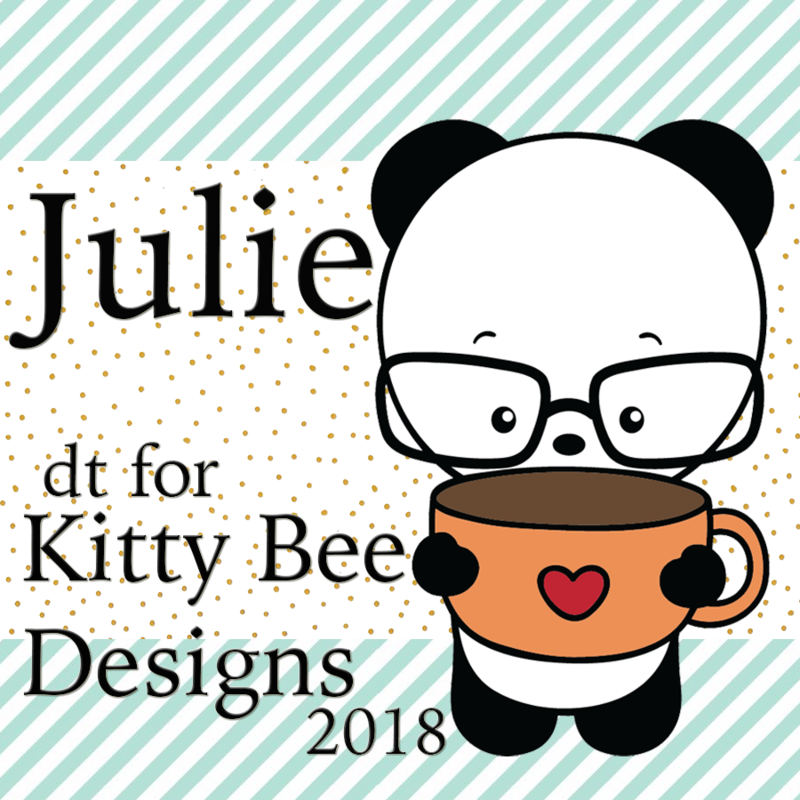 I'm posting today for Kitty Bee Designs, where it's time for my monthly designers spotlight. I am sharing an adorable Christmas Panda from the Kitty Bee Designs Etsy Shop. 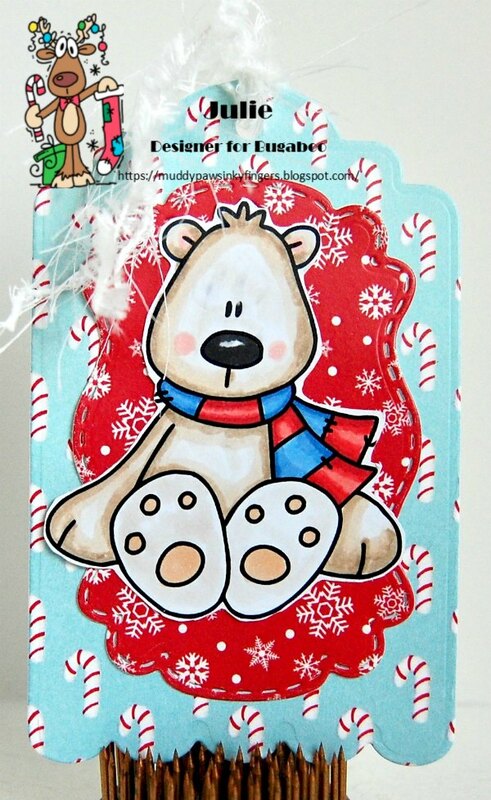 This is Ms. Christmas Panda, an acrylic stamp that is available for pre-order now. She's perfect for your Christmas cards! I colored Ms. Christmas Panda in bright, non-traditional Christmas colors using Copic markers, then used some non-traditional papers to keep the look going. The papers on this card are from We Are 3 Digital Shop. They are part of the Color Me Christmas Collection. 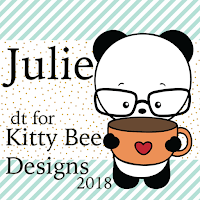 You'll find more new acrylic stamps to pre-order and great digi stamps in the Kitty Bee Designs Etsy Shop. Go have fun exploring! Can it be?!? I've got something beside a Christmas card on my blog today! Hurray! Perhaps there's a light at the end of the tunnel! I have an adorable image from Kinda Cute by Patricia Alvarez today. I've been wanting to color this one up for quite some time now -- ever since I first saw it, actually! 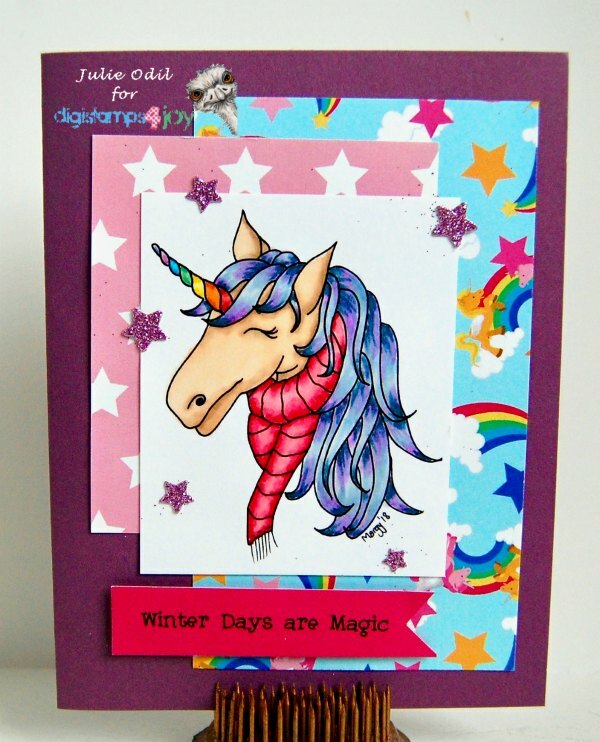 This image is one of 3 unicorns in the Unicorn Stamp Set found in the Kinda Cute by Patricia Alvarez Store. I wanted my unicorn to stand out in that field of horses, so I colored him with lots of bright colors using Copic markers, then fussy cut him out. The paper, foil tape, card stock, and gems are all from Close To My Heart. After you've checked out the Kinda Cute by Patricia Alvarez Shop, there's her blog with great inspiration, and fantastic examples of her colored images, and the Kinda Cute by Patricia Alvarez Facebook group, too, including a monthly challenge! Come join the fun! 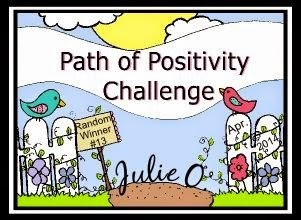 It's the first Monday of the month, so it's time for a new challenge at the Path of Positivity Challenge Blog. 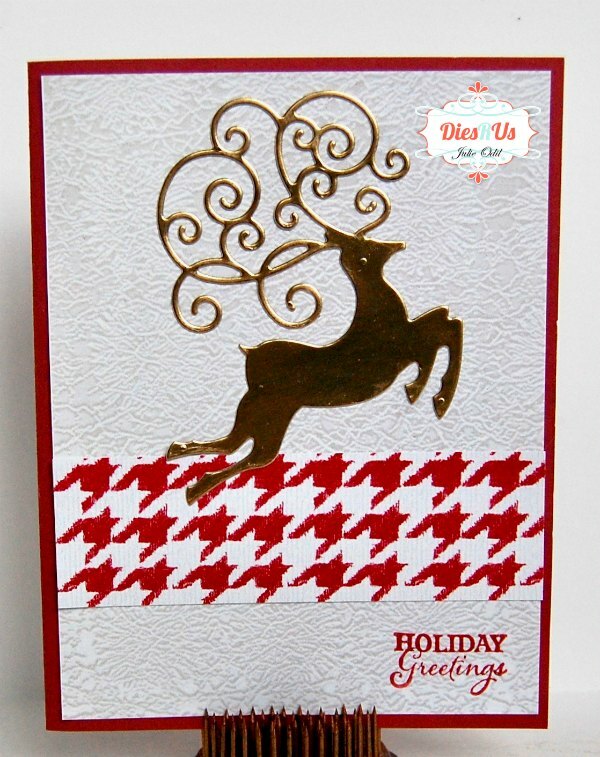 We've had optional color themes all year long, and we're winding it up this month with Metallics, Foils, and Glitters. Our sponsor for both the start and mid-challenge is Sparkle 'N Sprinkle. I have a new hot foil machine by Crafter's Companion, and I used it, along with a hot foil stamp, to create the background of this card. I used silver foil paper behind the sentiment, then some pink glitter paper to cut out the heart. I figured that would do well for our "Metallics, Foil, and Glitter" optional themed challenge. I hope you find time to join us during this busy month of December. When you have that glitter and foil out, link it up at The Path of Positivity Challenge Blog! 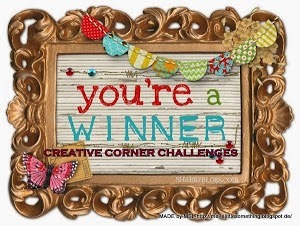 December 3 -- this is the day we start a new challenge on the Sasayaki Glitter Challenge Blog. 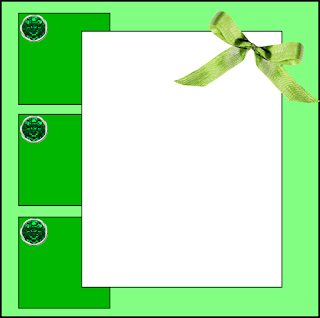 The theme for this month's challenge is "Happy Holidays". I love the charming images that Naz has in her Sasayaki Glitter Etsy Store, and this Snowman & Bird is just delightful to color up! I colored Snowman & Bird with Copic markers. I used papers from We Are 3 Digital Shop on this card. The circle is from the Kerst Christmas Collection. The strip of teal paper is from the Touch of Teal collection. The stitched snowflakes are dies from Lawn Fawn, cut out with glitter paper. The glimmer trim and card stock base are from Close To My Heart. I hope you are able to join us this month at Sasayaki Glitter Challenge Blog as you finish up your Christmas cards. The theme is "Happy Holidays". The 'Tis the Season of Awkward Holiday Chaos Event continues at Bugaboo Stamps. You'll find all the fun over at the Catch the Bug Blog. Today's fun challenge is "Bring on the White Elephant Gifts" -- create gift packaging -- a tag, a gift card holder, a gift, anything that fits the theme. I colored the Polar Bear with Copic markers, then fussy cut it. 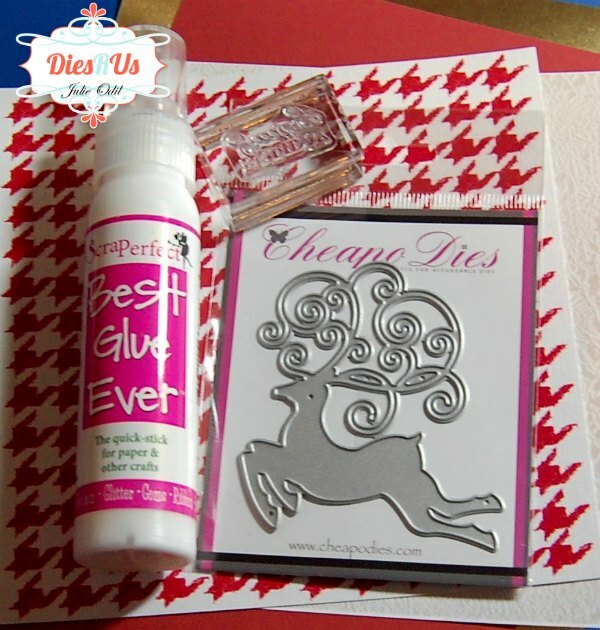 I used tag dies from Close To My Heart to construct the Christmas gift tag. Papers for the tag are from Kinda Cute by Patricia Alvarez. They are from the Blue Christmas papers. The white fibers are from Close To My Heart. So, bring on the white elephant gifts! Join the challenge! 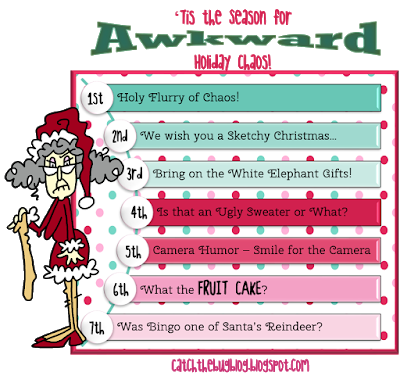 Have you been able to join in on the 'Tis the Season of Awkward Holiday Chaos fun this week? There's still plenty more to come! 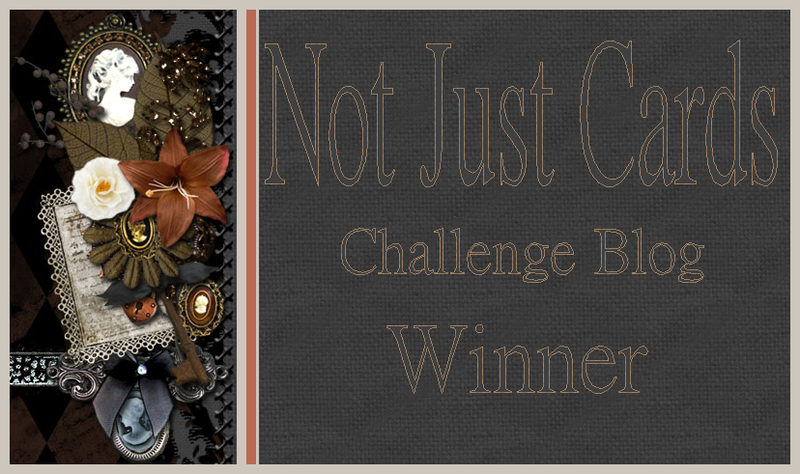 You'll find it all over at the Catch the Bug Challenge Blog! 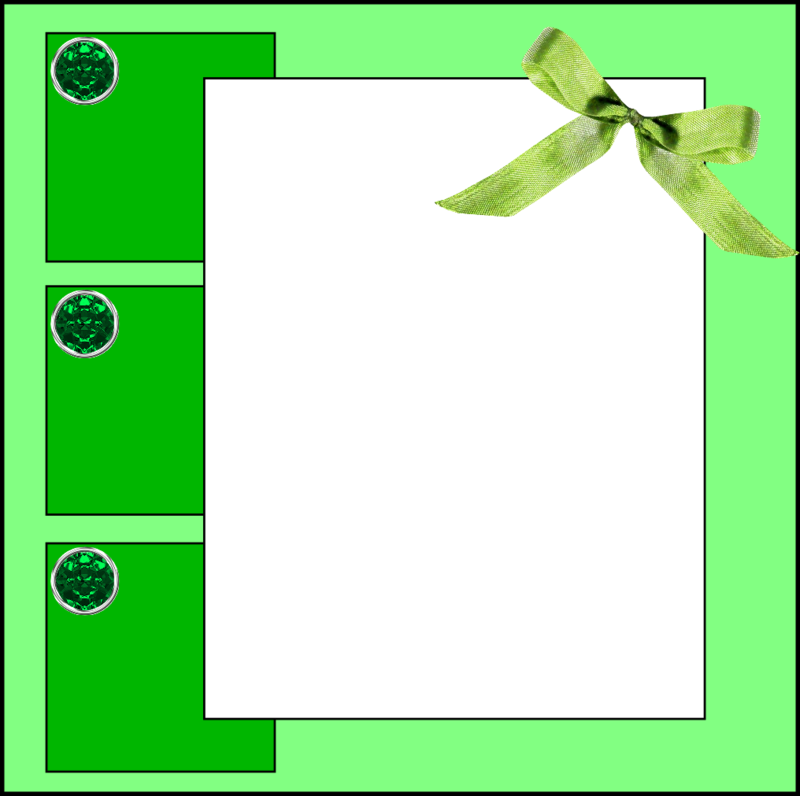 It is day 2 of the Tis the Season of Awkward Holiday Chaos event at Catch the Bug Challenge blog. First my card, then the sketch, then all the details of the fun and prizes to be had this week! This card uses Winter Birds - Skate. I colored this charming bird with Copic markers. Winter Birds -Skate is full of joy - I can just tell from the bright colors and way she's skating right along through the winter wonderland! She's one happy bird! Every year, Jodie is super generous with the prizes, so it's definitely worth coloring us a Bugaboo image (or 2 or 3 or 7!) and playing along! Enter as many days as you'd like, but please join in the Holiday Chaos fun!